Once again, my boss bossed me around until we came up with something AMAZING! If you are new to Stitch11, my boss is a 6 year old. 😉 She was so excited to share her fox and wolf idea with me, and quick to destroy my yarn stash while finding all the perfect colors. I can’t complain though… I LOVE IT! 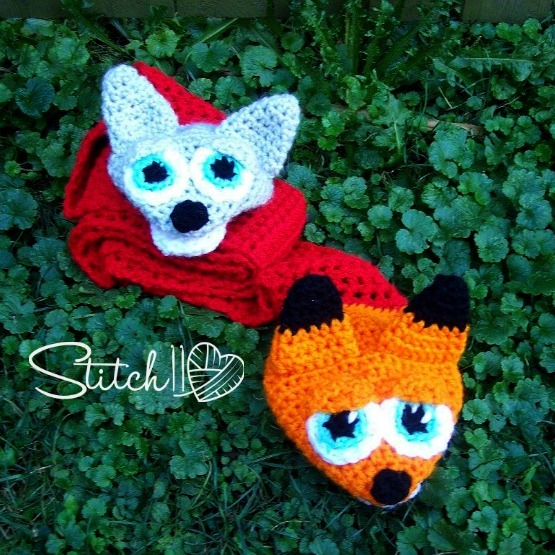 The Fox and Wolf – Puppet Scarf is a free crochet pattern, designed with Medium Weight – Red Heart Super Saver and Red Heart with Love. Row 1: CH 20. Turn. Skip 1. SC 19. Repeat row 2 149 times or until scarf is around 5 ft 4 inches (if making for child). Round 1: Magic Circle. CH 1. 7 HDC into magic circle. Join to first HDC. Pull ring tight. Round 1: Magic Circle. CH 1. 5 HDC into circle. Join to first HDC. Pull ring tight. 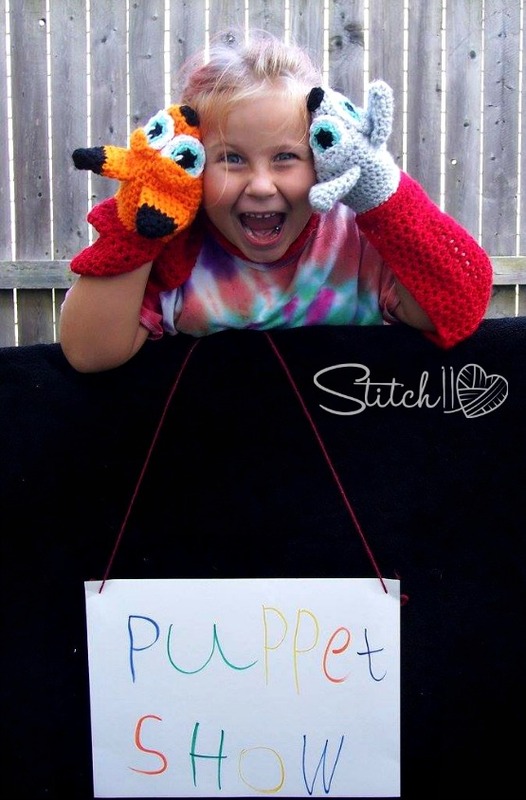 Hold the thumb portion/bottom jaw up with the head of your puppet. Line up the stitches so they can be joined together. Joining the two pieces together, slip stitch into next 7 stitches. Round 18: Slip stitch into each of the 33 stitches. Finish off leaving tail for attaching to scarf. Round 1: Magic Circle. CH 1. 8 HDC into magic Circle. Join to first HDC. 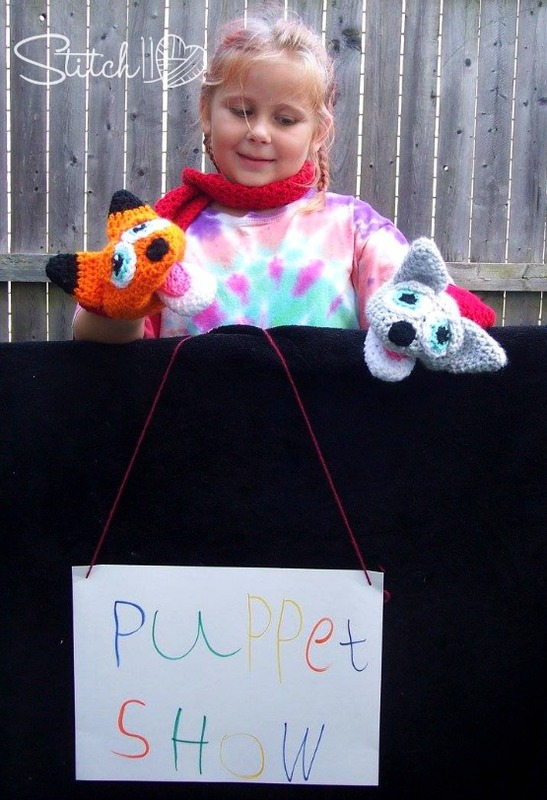 Finish off and leave long enough end for attaching to the puppet. With the fox, rows 1-4 are with color E. Finishing with color C.
The Wolf is crocheted entirely with color D.
Round 1: Magic Circle. CH 1. 6 HDC into magic circle. Join to first HDC. Finish off and leave long enough end for attaching to puppet. Round 1: Magic Circle. CH 1. 6 SC into circle. Join to first SC. Round 3: BLO. CH 1. *2 SC into next stitch. 1 SC into next stitch. Repeat from * 5 more times. Join to first SC. Row 1. Leave long enough starting end for attaching to puppet. CH 9. Turn. Skip 1 CH. SC into each of the 8 remaining CH. Row 2. CH 1. Turn. HDC DEC 4 times. Row 3. CH 1 Turn. SC-4-TOG. Round 1: CH 8. Skip 3 CH. 4 DC into next CH. 1 DC into into each of the next 4 CH. CH 2. Slip stitch into same CH. CH 2. Rotate tongue, crocheting into the other side of the CH. 1 DC into next 4 CH. Join to top CH of the 3 CH you skipped in the beginning of this round. Finish off leaving long end for attaching to puppet. Attach the eyes, nose, ears and then the eyelids. I didn’t attach the bottom of the eyelids Then attach the scarf ends onto the top of each puppet. While attaching my eyes, I took the yarn needle and a white yarn end, and added a sparkle onto each of the eyes. When attaching my eyelids, I only attached the curved top, not the bottom. When attaching the tongue, attach the entire way around. Omg this so adorable! 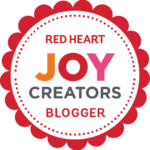 I’m 49 years old and childless, so I’m just going to make this for myself…..I just have to make it! Hello! I would like to contact you more personally, but your ”contact” button doesn’t work ! I would really appreciate it if you would send me an email at miimiie1712@live.fr, whenever you are free ! I would like to ask questions about this website and ask permission to use one specific image !